Many structural abnormalities in the fetus can be reliably diagnosed by an ultrasound scan, and these can usually be made before 20 weeks. Common examples include hydrocephalus, anencephaly, myelomeningocoele,achondroplasia and other dwarfism, spina bifida, exomphalos, Gastroschisis, duodenal atresia and fetal hydrops. With more recent equipment, conditions such as cleft lips/ palate and congenital cardiac abnormalities are more readily diagnosed and at an earlier gestational age. Excessive or decreased amount of liquor (amniotic fluid) can be clearly depicted by ultrasound. Both of these conditions can have adverse effects on the fetus. In both these situations, careful ultrasound examination should be made to excludeintraulterine growth retardation and congenital malformation in the fetus such as intestinal atresia, hydrops fetalis or renal dysplasia. See also FAQ and comments. Confirmation of fetal presentation in uncertain cases. Evaluating fetal movements, tone and breathing in the Biophysical Profile. Diagnosis of uterine and pelvic abnormalities during pregnancy e.g. fibromyomata and ovarian cyst. 3-D ultrasound can furnish us with a 3 dimensional image of what we are scanning. The transducer takes a series of images, thin slices, of the subject, and the computer processes these images and presents them as a 3 dimensional image. Using computer controls, the operator can obtain views that might not be available using ordinary 2-D ultrasound scan. 3-dimensional ultrasound is quickly moving out of the research and development stages and is now widely employed in a clinical setting. It too, is very much in the News. Faster and more advancedcommercial models are coming into the market. The scans requires special probes and software to accumulate and render the images, and the rendering time has been reduced from minutes to fractions of a seconds. An increasing volume of literature is accumulating on the usefulness of 3-D scans and the diagnosis of congenital anomalies could receive revived attention. Present evidence has already suggested that smaller defects such as spina bifida, cleft lips/palate, and polydactylmay be more lucidly demonstrated. Other more subtle features such as low-set ears, facial dysmorphia or clubbing of feet can be better assessed, leading to more effective diagnosis of chromosomal abnormalities. The study of fetal cardiac malformations is also receiving attention. The ability to obtain a good 3-D picture is nevertheless still very much dependent on operator skill, the amount of liquor (amniotic fluid) around the fetus, its position and the degree of maternal obesity, so that a good image is not always readily obtainable. Most experts do not consider that 3-D and 4-D ultrasound will be a mandatory evolution of our conventional 2-D scans, rather it is an additional piece of tool like doppler ultrasound. Most diagnosis will still be made with the 2-D scans. 3-D ultrasound appears to have great potential in research and in the study of fetal embryology. Whether 3-D ultrasound will provide unique information or merely supplemental information to the conventional 2-D scans willremain to be seen. Many centers are now performing an earlier screening scan at around 11-14 weeks to measure the fetal nuchal translucency and to evaluate the fetal nasal bone (and more recently, to detect tricuspid regurgitation) to aid in the diagnosis of Down Syndrome. Some centers will doblood test biochemical screening at the same visit. 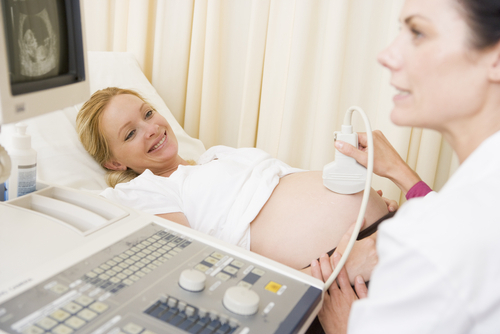 That a pregnancy should be scanned at 18 to 20 weeks as a rule is gradually becoming a matter of routine practice. It should be borne in mind that prenatal ultrasound cannot diagnose all malformations and problems of an unborn baby (reported figures range from 40 to 98 percent), so one should never interpret a normal scan report as a guarantee that the baby will be completely normal. Some abnormalities are very difficult to find or to be absolutely certain about. Some conditions, like for eample hydrocephalus, may not have been obvious at the time of the earlier scan. The position of the baby in the uterus has a great deal to do with how well one sees certain organs such as the heart, face and spine. Sometimes a repeat examination has to be scheduled the following day, in the hopes the baby has moved.